Outrage over anti-Semitic remarks in Hungarian parliament continued unabated, with Jobbik deputy calling for resignation of 'Israeli' MP. Outrage over apparent anti-Semitic remarks in the Hungarian parliament continued unabated Thursday, as a far-right deputy called publicly for the resignation of a fellow MP who claimed to have Israeli citizenship. At a press conference, deputy Elod Novak of the neo-Nazi Jobbik party, which has long been accused of espousing blatantly anti-Jewish sentiments, called for the resignation of Katalin Ertsey, of the small opposition party LMP, saying that it was unacceptable that she had kept her dual Hungarian-Israeli citizenship secret. He later told news portal Index, "Israel has more deputies in the Hungarian parliament than they have in the Israeli Knesset." He said this explains why the Hungarian parliament made so many decisions that were favorable to Israel, without providing any examples, AFP reported. Novak's comments came in the wake of remarks by fellow Jobbik deputy Marton Gyongyosi who, during a parliamentary debate on Monday on the recent conflict in Gaza, proposed drawing up a list of people in the country "to see how many are of Jewish origin and present a certain national security risk to Hungary." He later apologized to his "Jewish compatriots," saying he meant only those holding dual Hungarian-Israeli citizenship. Novak then sent an email to all deputies Wednesday requesting they make any dual citizenship public, in the public interest. Ertsey replied that she was an Israeli citizen and had bought her Hungarian citizenship, prompting Novak's call for her resignation, according to AFP. Ertsey later said she was in fact a Hungarian citizen but that her response had been an effort to elucidate the absurdity of Novak's question. According to Attila Peterfalvi, president of the National Data Protection and Freedom of Information Authority, while an MP's dual citizenship is in the public domain, his or her nationality is not. Having to declare that would be a "violation of human dignity," he said. Gyongyosi's remarks Monday were met with widespread condemnation from politicians, with one prominent Jewish organization saying it would file charges against the anti-Semitic lawmaker. The government was criticized for its slow response but issued a statement the next day condemning "all forms or expressions of extremism, racist or anti-Semitic." Jewish organizations have organized a mass protest against Nazism outside parliament on Sunday with politicians from across the political spectrum, including the ruling Fidesz party, expected to speak. 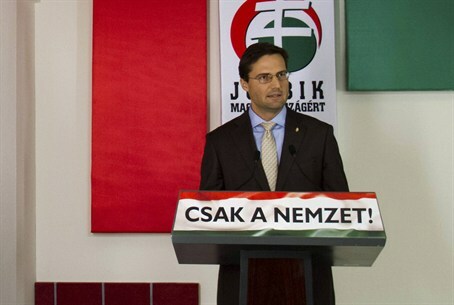 Jobbik responded in a statement Thursday that it found it "pathetic" that "the government parties have bowed to pressure and are taking part in a united grand coalition of the left-wing."